It is an ongoing process of mine to add to my collection of cookery texts from the Dark Ages and the Medieval era. Often, this requires that I borrow books through inter-library loan, as many of the texts I want are far outside my price range. I was especially happy when a copy of A Soup for the Qan (translated from a text written in 1330) arrived in this manner. This recipe is a culinary recreator’s dream – simple, just a few ingredients (that aren’t that unusual or difficult to obtain if you’re already into medieval cooking), and a straightforward preparation method. Best of all, it includes measurements! The first thing I had to do was find modern equivalents for the measurements. The translator’s and editor’s notes in the text revealed that a liang equals approximately 31.25 grams. A ch’ien is 3.12 grams, or 1/10 liang. Sixteen (16) liang equals 1 chin, which is approximately 500 grams. A ho is 3.17 cubic inches, or 51.9 cubic centimeters, or 51.9 milliliters. Then began the quest for ingredients. For the beef, I used Milanesa steaks from our grocery. They are thinly sliced and perfectly suited to drying. I had black pepper, long pepper, and grains of paradise in my pantry already. The one potential snag I found was the inclusion of mandarin orange peel. Mandarin oranges (citrus reticulata) are the same as tangerines (citrus reticulata), which are a seasonal fruit. It is for this reason that I chose use dried peel; the fruit is available now, in late fall, but if I wanted to prepare the beef in summer, I would be unable to obtain the fruit. I had to harvest and prepare the zest now so I could use it during the warmer months. This made my daughter very happy – she loves oranges. She ate all the fruit with the agreement that she would save the peel for me. After she finished snacking, I could simply remove the pith (the bitter white part) and leave it in the air to dry. Tsaoko cardamom and lesser galingale required a little research. 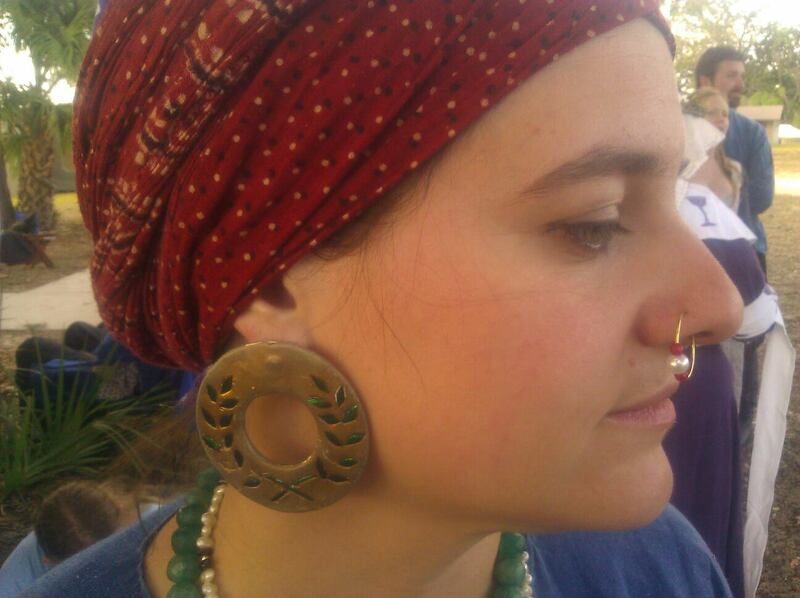 The Qan text revealed that tsaoko meant “large”. The botanical name of this plant is Amomum tsao-ko, which is the name for several varieties of cardamom, including black, brown, red, and white. Fortunately, I already had the brown variety in my pantry. Lesser galingale has several aliases, and there is quite a bit of misinformation on the internet about which plants are called by this name. I did eventually discover that it is not zedoary, white turmeric, or kencur, but it is the same galingale I had in my pantry. It is also called Chinese ginger, China root, India root, and galangal. 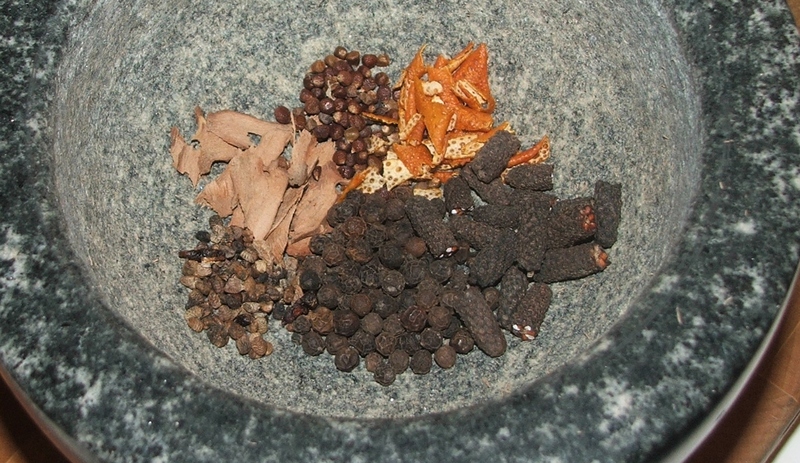 I measured the spices into a mortar, then ground them by hand. The fragrance was quite pleasingly aromatic, but very strong. Then I grated the ginger to squeeze it for the juice. 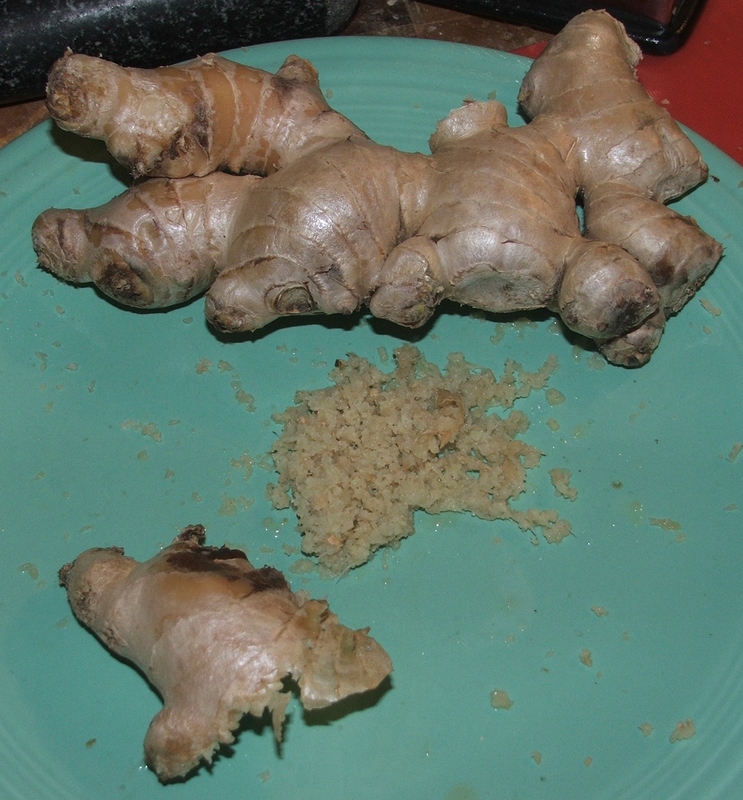 It took nearly ¼ pound of ginger to obtain the 3 ½ tablespoons of juice I needed. After the spices were ground and the ginger and onion were juiced, I combined them with the salt in a Ziploc bag. (This would probably have been done in a crock or in a pouch made from an animal’s stomach, but I have neither.) I cut the beef into strips and added it to the mix. It didn’t appear to me that I had enough marinade to thoroughly distribute among all the meat, so I added ½ cup of water to ensure that all the strips of meat would be coated with the seasoning mixture. It made coating the meat much easier. Although it was not listed in the ingredients or in the process, I believe adding the water is an acceptable modification. Joan Santanach, the editor of The Book of Sent Sovi, a 14th century Catalan culinary collection, clearly noted that recipes of that era were written by professionals for professionals, so there was an understanding that the reader would have some knowledge of culinary processes and would therefore not need every detail spelled out. I left the mixture to soak for two days, turning it occasionally to ensure distribution of the flavorings. After the meat had marinated for two days, I lightly scraped off the clumps of spices. There was no liquid left in the bag. 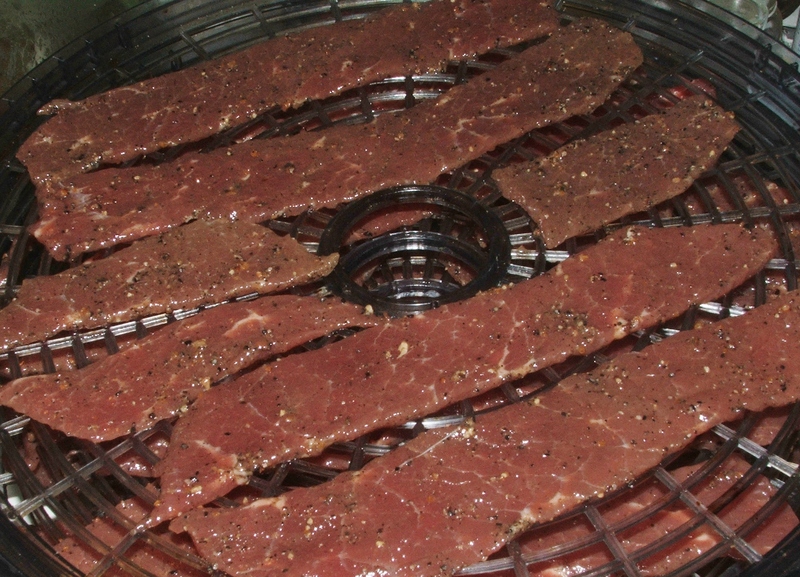 I laid the strips of meat on the trays of our dehydrator and let it dry. I had no proper “fire” over which I could hang the meat, and the dehydrator seemed just as logical an option as hanging it in the oven on a low temperature. After about six hours, the strips of steak were thoroughly jerkified. To say the jerky is flavorful would be an understatement. The tangerine is right there in your nose as soon as you taste it. The long pepper (and to a slightly lesser extent, the black pepper) spikes soon after that, and the ginger spreads its heat across your mouth. It’s absolutely no surprise that this was used to cure a “chronic chill”. Also, by the virtue of being dried meat that would rehydrate in your stomach, it’s easy to see how they believed it would cure compulsive eating. Buell, Paul and Eugene Anderson. 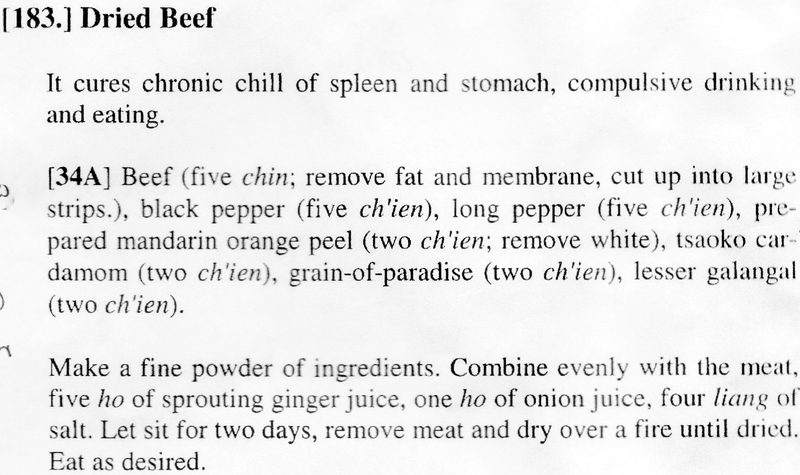 A Soup for the Qan: Chinese Dietary Medicine of the Mongol Era as Seen in Hu Szu-Hui’s Yin-Shan Cheng-Yao. London: Kegan Paul International. 2000. “Metric Conversion Charts and Calculators”. http://www.metric-conversions.org. http://www.hort.purdue.edu/newcrop/morton/mandarin_orange.html. Accessed 12 August 2011. Santanach, Joan, editor. Robin Vogelzang, translator. The Book of Sent Sovi: Medieval Recipes from Catalonia. Rochester, NY: Tamesis, Boydell and Brewer. 2008. This looks wonderful! I will be trying this out soon. Thank you.